The Fifteenth Sunday after Pentecost - Master, Which is the Great Commandment? For Christians, there does not exist a more effective teaching than reading the life of a saint – especially that of one who has lived in our own time and who, by his own life, was manifested as a saint without fanfare or any eulogy spoken by some important personage….Orthodox people …have no need of theories and philosophies, but they do have need of holiness. Several years ago one of our teenagers challenged me with this question: Why should I go to church on Sunday? What difference will it make in my life if I light a candle, stand up, sit down and sing some hymns? A good question! An honest question from a young woman trying to understand her Orthodox Faith. The life of this new saint of our church illustrates the tremendous spiritual power and great grace available through the Divine Liturgy of our church. The future saint was born on the Greek island of Naxos in 1851, his parents were somewhat wealthy but also pious Orthodox Christians having a chapel on their property in honor of St. Nicholas of Myra. As a young boy he often played church while wearing a bed sheet and served as an altar boy for his grandfather, Father George Melissourgos. His father died when he was fourteen which led his mother to move to Athens along with his sister. His mother provided for her two children by cleaning homes, often taking her children along since she feared leaving them alone in the midst of this bustling city. At the age of seventeen his mother convinced him to marry a young woman named Eleni Provelegiou and they were soon blessed with a son whom they named John. Father Nicholas was ordained deacon in 1879 and priest in 1884 and soon after his young wife died leaving him a widower with a young child. Shortly after his ordination as deacon, he and his sister divided their inheritance between them. 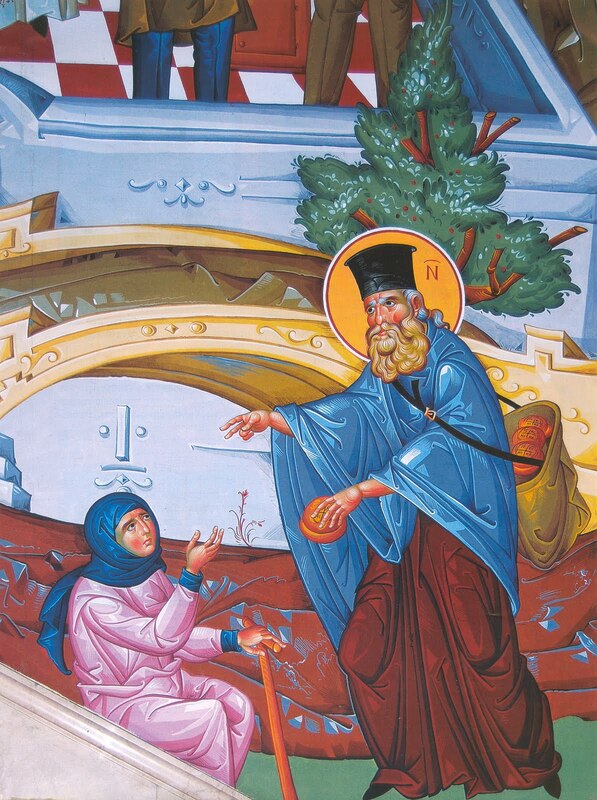 Father Nicholas used his portion as security for the debt of a neighbor in danger of losing his property. The neighbor defaulted on his debts and St. Nicholas lost all that he had inherited from his parents. His first parish assignment was to the church of St. Panteleimon which consisted of just thirteen families. Soon another priest without a parish convinced the parish council to dismiss Father Nicholas and appoint himself as the priest. Father Nicholas was promptly fired and sent to serve the poor parish of St. John, a parish of only eight families. This experience caused him great pain and sorrow but one night as he left St. John’s to return home, he was crying on the road. Suddenly a young man met him said “Why do you weep, my Father? He replied, “I weep because they chased me out of St. Panteleimon’s”. “Don’t be sad, my Father, I am always with you” said the stranger. “And who are you, my child?” asked Father Nicholas. “I am Panteleimon…” and the young man vanished. Throughout his life he was blessed with many such visions of saints and angels. If anyone suspected that he had seen visions he would, in humility and to avoid gaining a reputation for holiness, deny it and say “I didn’t see anything; I just make things up”. The whole focus of the life of this priest was the liturgical services of the Orthodox Church. For the next fifty years Father Nicholas Planas served the Divine Liturgy every single day, in the cold of winter and the unbearable heat of summer, with Liturgies beginning early in the morning and continuing until early afternoon. His Liturgies were so lengthy because he would pray for hundreds of people both the living and the dead. He had bundles of scraps of paper with the names of people he would pray for, calling them his “invoices and contracts”. His assistants, wanting to shorten the Divine Liturgy and return home, would at times throw away some of the older requests for prayer without his knowledge. When people would ask him why he stayed so long in church he would say “When you open your shop, don’t you sit inside all day? And for me, church is the same”. While celebrating the Liturgy he was observed floating off the ground or with a glimmering light over his head. Numerous miracles have been recorded as a result of his prayers: healings of physical illnesses, mental illness, family discord, the ability to foretell the future of people who came to him. He celebrated the Divine Liturgy for the last time on the Sunday of the Prodigal Son. As soon as he had completed the Liturgy he suffered a fainting spell and was taken home where he peacefully died on March 2, 1932 while in the care of his son John and daughter-in-law Marigoula. He was glorified as a saint by the Ecumenical Patriarchate of Constantinople in 1992 and his memory is kept on the day of his falling asleep in the Lord. May the life and witness of this parish priest, Father Nicholas Planas, the simple shepherd of Athens, challenge us to appreciate and love the great gift which is offered to us at each Divine Liturgy and never turn our backs from our Lord who offers Himself to us. and was His fervent worshipper.